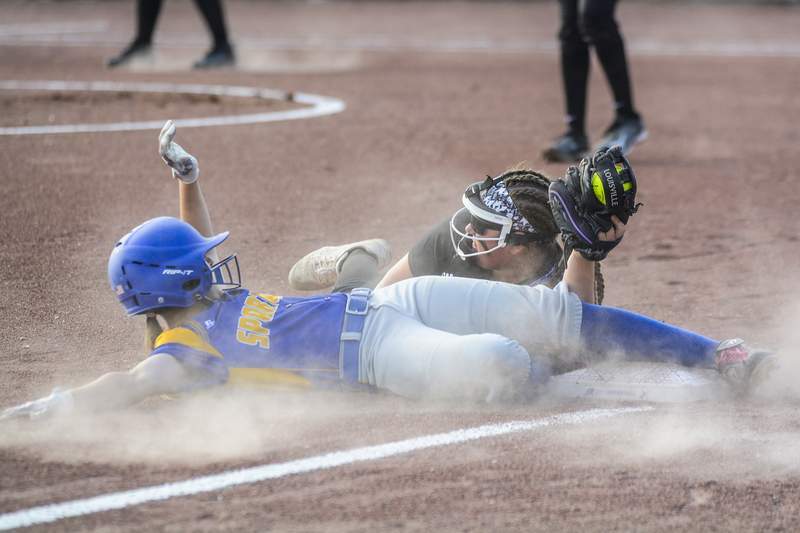 Brett Luke | The Journal Gazette Homestead's Katie Felger slides into third base safely during the first inning against Leo in a Class 3A regional. Brett Luke | The Journal Gazette Ashley Miller of Leo throws a pitch against Homestead at Leo in a Class 3A regional. LEO-CEDARVILLE – Leo had been thinking about the Class 4A Regional championship since last year's loss to Homestead. The Lions avenged that defeat in a 6-3 win over the Spartans on Tuesday to win their fourth regional title in five years. "Coming from last year and having so many mistakes and not being Leo, it's huge to come back and be able to win. It's awesome," senior catcher Corey Uetrecht said. "We were just waiting for the day we got to play them again. We have been waiting to come and get at them and be ready for it." Leo fell 11-7 in last year's regional championship, committing six errors in the loss. The teams faced each other on May 8 in a regular-season matchup in which the Lions won 14-0. But a year ago is what drove the focus. 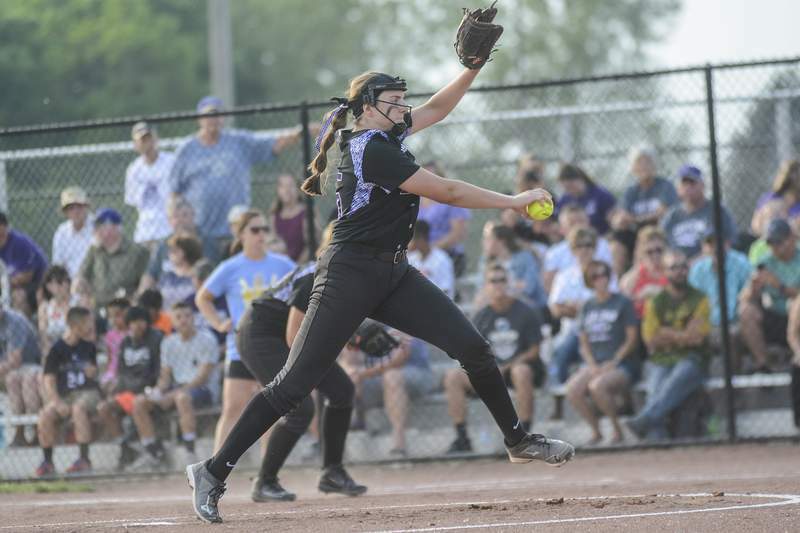 "When we were getting ready, it was really on our mind," Leo senior pitcher Ashley Miller said. "We just thought how it felt last year, and we didn't want to feel that again this year. It's a lot of redemption, it's just a good win for us. "We just had to stay focused. We know they're a good team, forget about the game and focus on this game only." The teams kept the game close in the first few innings with the game tied at 2 after the top of the third. The Lions broke it open in the bottom of the inning, batting around and scoring four runs. With one out, Morgan Stuckey walked to load the bases. Simia Spahiev hit a single to score Lauren Daniels. Uetrecht hit a line-drive double to score Mackenzie Rust and Stuckey to make it 5-2, and Ellenor Schelm followed with a bloop hit to score Spahiev. "We had to keep the ball on the ground," Lions coach Ben Shappell said. "We did that for the first 3 1/2 innings but in the late innings, we started popping the ball up. If we had done that the whole game, this would be a completely different game. "It was good to see them hitting on the ground and line drives those first three innings because without those hits, we would not have been able to win this game." Miller earned the win for Leo, giving up two hits on one run, walking two and striking out two in three innings. Rust got the save with seven strikeouts in four innings, giving up two hits. "They're good batters so we had to stay focused in pitching," Miller said. "I had to make sure every pitch counted and stay focused." Uetrecht was a freshman on the 2015 team that advanced to the state finals, the final year the Lions were in 3A. She's the only remaining member of that team. She said this team shares a commonality with the team three years ago which gives her a lot of confidence in the quest for a state title. "I was the only one there but I was the bullpen catcher. I helped a lot back there and I was a cheerleader, supporting them," she said. "I feel like everyone knows their role. The freshmen, some of them get to play, some of them need to be there for support, that's where I played back then. I just feel like we definitely play better than we did back then so it's cool. "It gives a lot of confidence (going into semistate). We have a lot of confidence going in, we just need to make sure we don't get a big head and make sure we play the best of our ability." The Lions will play Noblesville in the semistate semifinals at Lafayette Harrison at 1 p.m. Saturday.